Charles Follen McKim (1847-1909) was the son of a leading figure in the abolitionist movement. Not an outstanding student, he attended Harvard for a year. Then, following in the footsteps of H. H. Richardson and Richard Morris Hunt, he convinced his parents to send him to study architecture at the École des Beaux-Arts in Paris. In 1870 he began his career as a draftsman for Richardson in New York. By 1879 McKim, Mead & White was established, working on significant residential projects for society’s elite and major civic projects in Newport, Boston, and New York. Daniel H. Burnham, the director of works for the World’s Columbian Exposition of 1893, brought McKim and several other East Coast, Beaux-Arts trained architects to Chicago to design individual buildings and the plan for the main exhibition grounds of the fair. Many considered McKim’s Agricultural Building the most beautiful. The fair’s neoclassical design was enormously popular and played a large role in the subsequent City Beautiful Movement in architecture and planning which held sway in American cities for over thirty years. Chicago architect Louis Sullivan, of course, disapproved of the classic taste and championed what was later to become the vibrant Chicago school of architecture. While working in Chicago, McKim met real estate developer Bryan Lathrop and accepted the commission to build a house for him and his wife Helen Aldis Lathrop. Lathrop House, now home of The Fortnightly of Chicago, was called “one of the finest examples of Georgian Revival architecture in the country” in the City of Chicago’s 1974 Landmark citation . . . although it could also be said to be one of the only pieces of Georgian architecture in the city. McKim focused on every detail both inside and outside, including a design for a pool cue rack and different designs for each of eleven fireplace mantels. McKim, Mead & White became the leading architectural firm of its time. 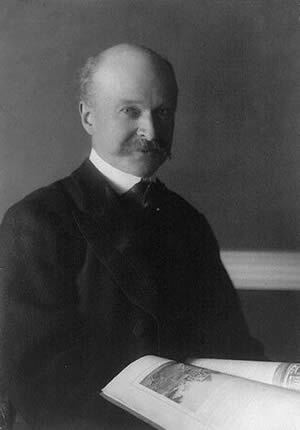 Highlights of the work for which McKim himself is best known include the renovation of the White House and the Plan of 1901 for the park system of Washington, D.C. In New York he designed the Century, University, and Harvard Clubs; the Pierpont Morgan Library; the Columbia University campus; and the Pennsylvania Railway Station. In Boston, he designed the Boston Public Library and Harvard’s Department of Ar­chitecture building; and in Newport, the Newport Casino. Those interested in learning more about this prominent architect can consult Triumvirate: McKim, Mead and White: Art, Architecture, Scandal and Class in America’s Gilded Age by Mosette Broderick, who spoke at the Fortnightly in March 2011.